$10 Million Guaranteed at PokerStars’ Sunday Million! 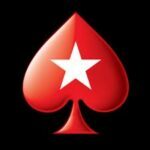 PokerStars continues to celebrate its 10th Anniversary in the most innovative and unique ways. 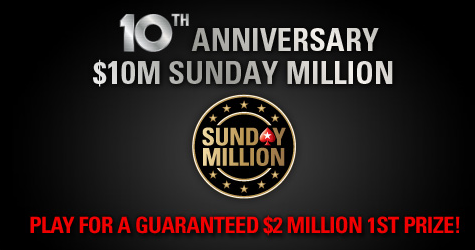 This coming Sunday will likely see the biggest Sunday Million ever, featuring a guaranteed prize pool of $10 million! The first ever Sunday Million event was held on March 5, 2006. 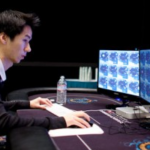 It was contested by approximately 6,000 online poker players and featured a top prize of almost $175,000. 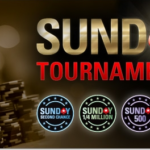 Since then, the Sunday Million has become the poker site’s flagship event. With an average of about 7,000 players taking part in the Sunday Million each week, it has become the preeminent online poker tournament, far surpassing average participation on any other poker site or in any other regular online tournament. Up until now, the largest Sunday Million field ever was comprised of just under 60,000 players. The buy-in for the special 10th anniversary Sunday Million will remain unchanged at $215 and the tournament winner’s prize purse is guaranteed to be at least $2 million! If $215 is a bit much for your bankroll, PokerStars is also awarding 1,000 seats via a huge $11 Sunday Million Mega Satellite, which will take place about an hour before the Sunday Million begins. A $10 million guaranteed prize pool is also guaranteed to bring out some big names, specifically PokerStars Team Pros. This weekend’s Sunday Million will thus provide entrants with a chance to wage war at the virtual felt with some of the game’s greats. One last important guarantee for this special event is that PokerStars will be sure to trumpet the winner’s name far and wide. So, if you’re looking for a way to become a famous “name” online poker player, you’ve got your shot beginning at 2:30 Eastern this Sunday. Shuffle up and deal! 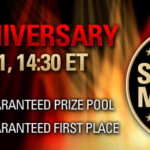 $5 Million Up for Grabs in PokerStars Sunday Million!